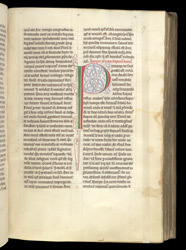 The start of the 17th sermon is marked by a large green and red initial, with penwork flourishing in red and blue. There are various aids to help the reader navigate through the text: the lines of text are numbered between the columns; the columns of each sermon are lettered alphabetically; and sermon numbers appear in the upper margin. Thus this page, with the end of Sermon 16, '16' in the upper margin, 'n' above the last column of Sermon 16, and 'a' above the first column of Sermon 17.